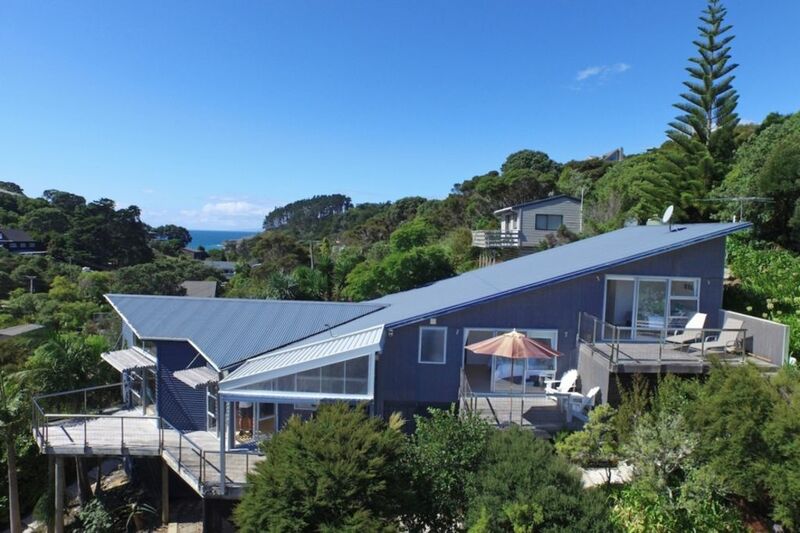 The Palms on Waiheke Island is beautifully presented and well equipped for a relaxing holiday by the sea. Situated a few minutes walk from Sandy Bay and Enclosure Bay beaches, this 3 bedroom, 2 bathroom property offers all the comforts of home and plenty of room to spread out with family and friends. The open plan living, kitchen and dining area are light and bright, offer fantastic sea views and open up the house to a spacious deck with outdoor seating and BBQ area. The kitchen is fully equipped with room for a few chefs and the lounge offers plenty of seating, an assortment of games and books and a TV with DVD player. The bedrooms are spread out over two levels with two of the three bedrooms opening to private decks. Pack up the boogie boards (kayaks already here) and escape to The Palms for a memorable seaside holiday. Central location, close to award winning vineyards and restaurants. Great location, easy walking distance to Sandy Bay and Enclosure Bay for the little children. Great location, easy walking distance to Sandy Bay and Enclosure Bay for the little children. Use of kayak was a hit with the kids too. Lots of stairs but worth it for the views from the bedrooms! Well appointed house. We had a very enjoyable stay - thank you! perfect and everything was excellent. perfect and everything was excellent. Was one of our best stays anywhere. Great house. Large enough for all of us. We used the BBQ, kayaks and lifejackets. Well equipped with kitchen stuff. Amazing location, loved the bach! Beautiful sea views, and very close to a stunning little beach.